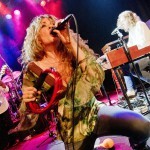 Dana Fuchs is a phenomenon, a singer whose mesmerizing voice and presence has led critics to compare her to rock legends from Janis to Jagger. Fittingly, she appeared in the Off Broadway production of Love, Janis. The multi-talented singer-songwriters stars in one of the most talked about cult films, Across the Universe, where she has a major presence in the film and soundtrack. Stereophile Magazine said it best, "Imagine a sultry, more emotive Janis Joplin." The Chautauqua Belle is an open-air Mississippi River-styled steamboat that has operated on Chautauqua Lake since 1976. Launched as part of the area's United States Bicentennial celebration, it is one of only five authentic passenger sternwheel steamboats operating in the country today.